We will begin in McSpadden Park at 11 AM with some pre-March festivities and a community art project to create the new Vancouver Dyke March banner for the year. Then, the March will leave McSpadden Park at 12 PM (noon) and we will make our way down Commercial Drive to end at Grandview Park for the Festival. The Festival will take place from 1 to 5 PM, and involve performances from various artists, feature queer-friendly vendors, and create a space to gather with friends, family, and the community. We hope to see you there! 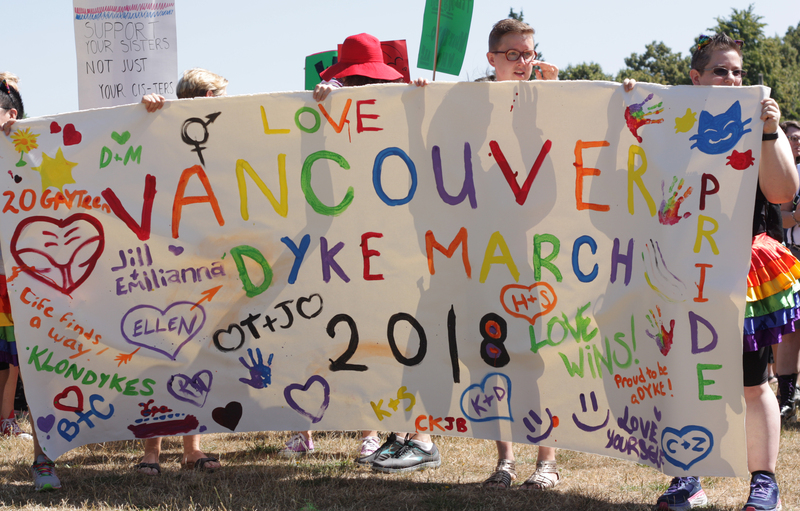 The banner from last year’s 2018 Vancouver Dyke March and Festival. The Vancouver Dyke March website is sponsored by WHAT’S ON QUEER BC at whatsonqueerbc.com.